8:51am An officer assisted a subject in entering her locked vehicle in the 900 block of E. Mansfield St.
9:38am An accident report was taken in the 1100 block of Rosedale Ave.
11:20am A subject requested a welfare check in the 400 block of E. Mansfield St.
11:34am Officers assisted Life Support in the 500 block of S. Spring St.
12:19pm A Marion Rd. resident reported a DVD player and meat missing from her residence. 1:16pm A report of a possible drug deal was received and remains under investigation. 1:54pm Juveniles were warned against wading in the industrial pond at Crossroads Blvd. 2:14pm Officers assisted the City Engineer in the 600 block of W. Charles St.
3:13pm A parking complaint in the 500 block of Woodlawn Avenue was investigated. 3:54pm Officers checked the welfare of a man walking on E. Mansfield Street. 4:05pm A verbal traffic warning was issued in the area of W. Beal Avenue and Linwood Drive. 4:06pm An employee at Job and Family Services reported her vehicle vandalized while parked outside the business yesterday. 4:13pm A resident in the 1000 block of Tiffin Street reported her credit card stolen and used fraudulently. 4:32pm Officers assisted an elderly female in the 200 block of Ethel Street. 5:13pm Amy Swalley, 37, was arrested on a Crawford County warrant. She was transported to the Crawford County Justice Center to be held for court. 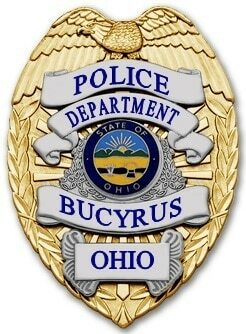 5:17pm Officers assisted a motorist locked out of her vehicle at Bucyrus Plaza. 5:39pm A report of an audible car alarm in the 900 block of Sherman Street was investigated. The alarm had reset and there was no damage found to the vehicle. 6:24pm Officers spoke with a group of kids playing near a car at the Bucyrus Public Library. 6:44pm A report of someone walking their dogs off leash in the 600 block of Link Drive was received. Before officers arrived, the caller advised the dogs were now gone from the area. 6:48pm Officers checked a couple 9-1-1 hang up calls in the area of Poplar and Oakwood Avenue. The caller was located and advised that there was no emergency , but he was having issues with a new cell phone calling accidentally. 6:51pm John Smith, 47, was arrested on charges of Disorderly Conduct by Intoxication. He was issued a minor misdemeanor citation and transported to the Crawford County Justice Center to be held until sober. 6:54pm Kimberly Dauchenbaugh, 27, was arrested at Kroger on charges of Criminal Trespass. She was issued a summons to appear in court and released. 7:18pm A syringe found in the area of E Mansfield and Highland Avenue was turned over to the Police Department for disposal. 7:42pm A false alarm at Eagle Crusher was investigated. 8:20pm A resident in the 500 block of S. Poplar Street reported a theft. 8:30pm A report of kids throwing things at cars on Marion Road was investigated. 8:40pm An open building on W. Charles Street was checked and secured. 9:05pm Officers assisted a motorist locked out of her vehicle at Walmart. 9:07pm A traffic citation was issued in the area of Marion and Pinewood Court. 9:07pm Brooke Bayless, 21, was arrested for felony possession of drugs, tampering with evidence and possession of marijuana. She was taken to the Crawford County Justice Center to be held for a court appearance. 9:08pm A report of someone inside a vacant building on High Street was investigated. The residence was secure and there was no one inside. 9:34pm Officers picked up an abandoned bicycle in 600 block of W. Warren St.
10:45pm A report of a 5 year old locked out of his residence alone in the 400 block of Myers St. was investigated. He was reunited with his mother. 12:01am A report of loud music at Woodbine Apts. was investigated. 12:36am An employee of the Inn at Orchard Park reported noises coming from the business’s dumpster. A large feline was found to be roaming the area. 1:27am Officers on patrol investigated a suspicious vehicle in the area of W. Mansfield St. and Nevada Rd. They were found to be doing work for the railroad in the area. 1:53am A resident in the 1000 block of E. Mansfield St. reported an unknown male knocking at her back door. He had left the area before officers arrived on scene. 2:30am Officers on patrol checked a building that was found to have an open door on Hopley Ave.
2:37am A false alarm in the 1000 block of Lavina Ave. was investigated.